Please excuse me as I will want to indulge in some interesting aspects of what Las Vegas has to offer. You can take the girl out of the strip, but the strip does certainly stay with you! When we strolled into the lobby of the famous Bellagio Hotel, it's ceiling design took my breath away. The artist is Dale Chihuly. He created this amazing sculpture in 1998 for the hotel's previous owner Steve Wynn. Its design was in the works way before the building's completion. 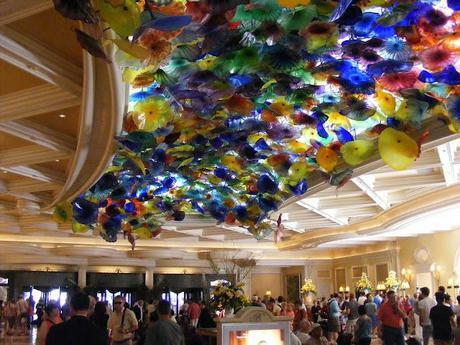 Called "Fiori Di Como", this incredible ceiling of flowers was installed with over 2,000 hand blown glass elements. This spectacular lobby is the perfect prelude to the fresh and beautiful flower motifs throughout the Bellagio. 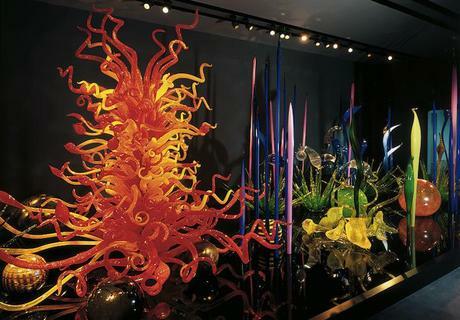 After studying interior design from the University of Washington in 1965, Chihuly enrolled in the first glass program at the University of Wisconsin. It was during this time that Chihuly led the avant-garde in the development of glass as a fine art and a legitimate artist's medium. He then went to work at the Venini glass factory in Venice. There he learned the art of a team's approach to blowing glass. It was this personal discovery that led to the more than 200 incredible displayed works today. Las Vegas is known for its sights and sounds in hedonistic pursuits. But it's nice to see that art and culture are alive and well, proudly posing in plain sight for all to enjoy. Welcome to Our New Intern Jaclyn! Throwback Thursday: Halloween Or the 1970s?